Lots of talk today about the new compact Olympus E-620 DSLR, and for good reason. This affordable, full featured camera is small enough to go just about anywhere. 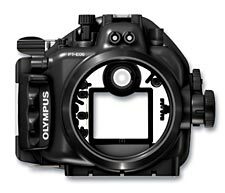 But what I think is also exciting is that Olympus announced an underwater case designed specifically for the E-620. Because of Live View mode, underwater shooters now have a bright, 2.7" LCD they can use for composing shots underwater. This is much easier than previous methods (of guessing the composition). The new Olympus housing is rated down to 40 meters underwater. It has five interchangeable lens ports available, so you can use your favorite lens underwater too. And it accepts an Olympus flash bracket. I think for many photographers, this rig is going to change their approach to underwater shooting.